When it comes to teams, do you wonder about motivations of others? What about your own? As the author of The DNA of Collaboration I’m excited to kick off our virtual Book Tour (via Twitter chat) this SAT 8/4 at 11aET. It should be an interesting and insightful conversation on “Intention” .. an important topic that I explore in Chapter 4. Q1. In team settings, can we detect (a.) going thru motions vs. (b.) acting from deep conviction? Can asking ‘why’ surface #intention? Q2. Wheatley and Maslow tell us survival is a primal motivator. In business, how does this impact our willingness to take risks? Q3. Dweck says learning & risk-taking are easy when we have a growth mindset vs. obsessing on our perceived fixed limitations. Agree? Q4. The 21st century seems to demand focus on quick wins over longer-term goals. Can both be achieved? What’s the priority? After brief introductions at 11aET, we’ll jump into the fray to tackle these questions. 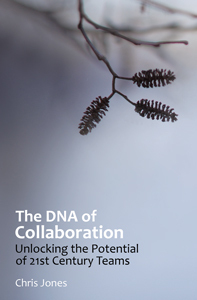 Want to get a feel for intentional collaboration in #cdna context? Use the “Look Inside” feature on Amazon .. I introduce the concept in the Prologue, which you can read in it’s entirety online. More on the series? Our broader agenda is taking shape. Thanks in advance for your interest; I hope to see you at this discussion, or at one like in in the weeks ahead. Mark your calendars: SATURDAYS 11am ET. This entry was posted on Friday, August 3rd, 2012 at 1:41 am	and tagged with collaboration, dweck, fixed mindset, growth mindset, intention, motivation and posted in booktour, context, intention. You can follow any responses to this entry through the RSS 2.0 feed. Great conversation this morning, thanks to everyone who came out. Did you miss it? No worries, here’s the transcript (pdf).